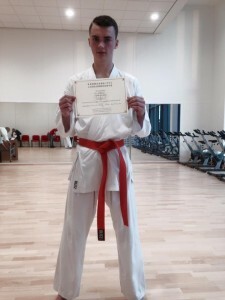 Sensei James “Jim” Bentham will be holding a summer course on the 28th July. I encourage all the children to attend and get to meet other people / children from various clubs whilst training. Those that have trained with Sensei Jim before will know that he is very knowledgeable and puts the teaching across very well, there will also be prizes/awards on the day. The course is for two hours and the cost is only £10, if you are interested please contact Sensei Jim (email at bottom of poster) or myself asap to book your place, if enough people book onto the course he may look at putting more on throughout the six week holiday. It is also with great pleasure I announce that he has also passed his Army Assessment days (which were just before grading by the way) and he will be leaving us to join the Army College in September. I am sure, like me, you will all wish him well for the future, he will be staying with the club until he joins the Army and I hope that he will continue to visit us all during his leave periods. Hello to you all, the Website is coming along nicely thanks to Chris Denny at Cristelin Design. I will be starting to use the website as it progresses and I get used to the new fandangled technology. Please all be reminded that the club grading (for those that are grading) is on the 11th of July, I will give the various times out in club. It is almost time for the school summer holidays and again I will update in club of the times that we are closed. Please feel free to leave comments, please make sure they are sensible and that children can read them. If not , then the offending comment will be removed without notice. This is as much the students website as mine, so please enjoy and use sensibly.